Lance has 9 Travel Trailer models. Since 1965, Lance campers have been the #1 truck camper in the USA and now offer one of the fastest-growing lines of travel trailers in the country. We’re proud of that heritage and know that your love of the outdoors will continue to grow as you enjoy your Lance travel trailer, or long or short bed truck camper for many, many years. The Lance campers you see on our site are the result of years of innovation that continually set the standard and raise the bar across the entire RV industry. 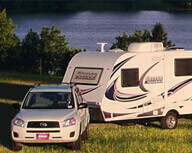 Our award-winning Lance campers lead the industry when it comes to quality, style, comfort AND customer satisfaction. We have not achieved a nationwide 40% market share in truck campers by accident – it’s due to our desire to build the finest quality slider campers and travel trailers available. Whether you are fishing, hiking, enjoying a new camping spot or tailgating at your favorite sporting event, we want you and your family to be as comfortable as you would be in your own home. There is no better place to begin your ownership experience than Lance Campers Direct! Contact us today for your best camper deal – the best truck campers, the best travel trailers, the best service, the best value - ANYWHERE! Or if your looking for a Lance Truck Camper click here.